One of the most often recommended human foods that can be given as very safe for pooches is peanut butter. It’s rich in proteins, vitamins A and E, magnesium, iron, calcium, folate, and even zinc. While it is a bit oily, having both poly- and mono- unsaturated fats, you can expect that these are still good for your pooch compared to saturated and trans- fats. As long as you go for the unsalted ones, peanut butters for dogs should be an excellent choice as a yummy and nutritious treat. And if you’re wondering which among the various brands of peanut butter treats for dogs you need to give to your furry friend, we’ve taken the liberty to search the market for you. Here are 8 dog-safe peanut butter treats you really have to give a try. Designed to help pet dogs that are predisposed to joint problems or even those that are already suffering from a variety of joint issues, Zuke’s Hip Action Peanut Butter and Oats Recipe Dog Treats can be considered more as a nutraceutical than it is a simple dog treat. This is because the Zuke’s Hip Action Dog Treat comes fully fortified with glucosamine and chondroitin in addition to vitamins and minerals for healthier and stronger joints. 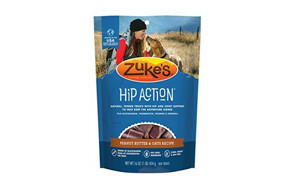 Like all Zuke’s products the Hip Action also comes without soy, wheat, and corn so it shouldn’t cause you any worry if you’re particularly averse to the idea of giving these grains to your canine friend. 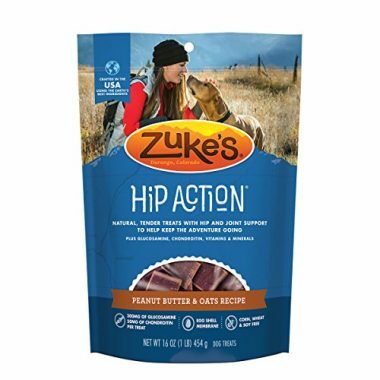 The Zuke’s Hip Action dog treat is made from real peanut butter and mixed with wholesome grains made of ground oats and rice as well as a variety of botanicals for added health benefits. One of the most often recommended human foods that can be given as very safe for pooches is peanut butter. It’s rich in proteins, vitamins A and E, magnesium, iron, calcium, folate, and even zinc. While it is a bit oily, having both poly- and mono- unsaturated fats, you can expect that these are still good for your pooch compared to saturated and trans- fats. As long as you go for the unsalted ones, peanut butters for dogs should be an excellent choice as a yummy and nutritious treat. And if you’re wondering which among the various brands of peanut butter treats for dogs you need to give to your furry friend, we’ve taken the liberty to search the market for you. Here are 8 dog-safe peanut butter treats you really have to give a try. Whether as a filler for medicine pill pockets or as an accompaniment to training treat tubes, you’ll definitely love the convenience and excellent palatability of the KONG Stuff’n Real Peanut Butter Tube. 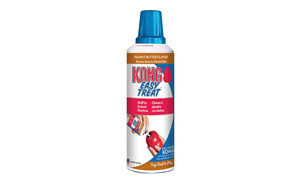 It’s more like the KONG Easy Treat except that the Stuff’n is smaller and comes in a squeezable tube with nozzle. The slender design of the nozzle allows for a more efficient and mess-free filling of your pill pockets or even treats. 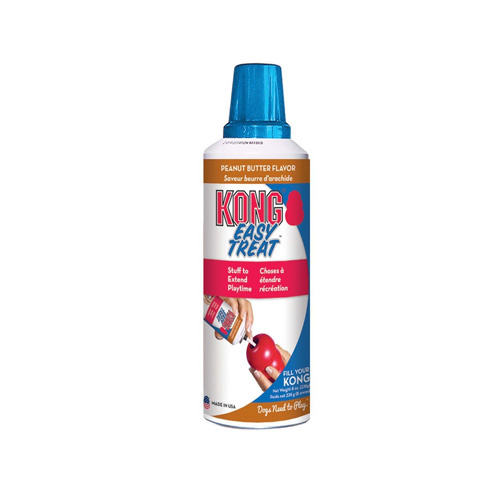 Most dog owners use the KONG Stuff’n for hiding the medicines that they have to give to their pooches, masking both the look and the flavor of the medicine. The KONG Stuff’n actually has a thinner consistency than a regular peanut butter, allowing for easier squeezing but without necessarily being too runny that it doesn’t coat the pill anymore. Plus, it does taste like real peanut butter for the simple fact that it is really made from roasted peanuts and hydrogenated vegetable oil. Sugar has been added, though so be careful especially if your pooch is prone to developing diabetes. 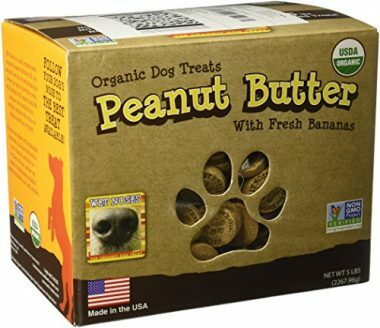 If you loved slathering peanut butter on your fresh banana when you were still a kid, or perhaps you still do, then Wet Noses’ All Natural Organic Dog Treats Peanut Butter with Fresh Bananas should be a great treat for your pooch. Although you will not be essentially slathering peanut butter on any banana, Wet Noses has already done this for you. Made of organic ingredients such as ground peanuts, bananas, eggs, and molasses, the Wet Noses doggie treats come in delectable biscuit form that tossing them to your pooch is super easy. It’s no-mess, full of fun doggie treating. Each batch of Wet Noses is baked to perfection with the same tender loving know-how of your granny’s biscuit- ad cookie- making prowess. Just make sure to following the treating recommendations by Wet Noses depending on the weight of your feline friend. 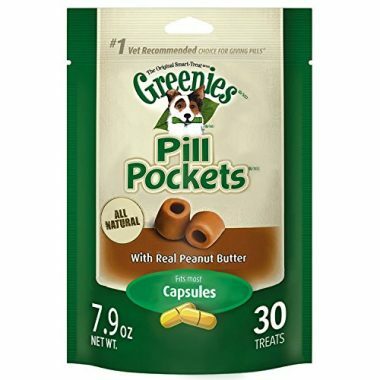 If administering medications in pill or tablet form to your pet dog is becoming more like a caged match on WWE, then you will definitely need the help of the Greenies Pill Pockets with Real Peanut Butter Treats for Dogs. These hollow tubular treats are uniquely designed to accommodate most sizes of doggie pills and tablets, making it super-convenient to administer and non-threatening for your pooch to take in. The really great thing about the Greenies Pill Pockets is that the ends can be pinched to seal off the tube, keeping the tablet or pill inside. It’s like playing with Play-Doh except that this one is moldable to hide the pill that your dog really needs to get well. The Pill Pockets are made of rehydrated chicken, peanut butter, and other wholesome ingredients. Greenies also included healthy botanicals into the mix giving it an excellent nutrient profile as a doggie treat. 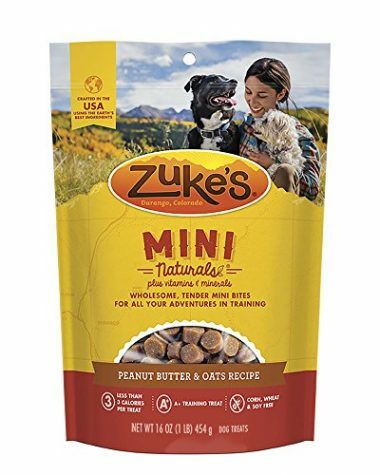 If you’re worried about the calories in doggie treats you’re giving to your pet, then you might want to try Zuke’s Mini Naturals Peanut Butter and Oats Recipe Mini Bites instead. These small, healthy, and moist peanut butter doggie treats only packs in less than 3 calories of energy per treat. And while these may not be energy-dense, the Zuke’s Mini Naturals are surely packed with nutrients such as Vitamins C and E and zinc. It even contains rosemary extract for added health benefits. You’ll also feel a lot safer with the knowledge that ZUke’s doesn’t include corn, soy, and wheat in its formulation, just all-natural peanut butter mixed with ground wholesome grains like barley, oats, and rice. Whose dog isn’t going to love the Zuke’s Mini Naturals? Too bad, though, it cannot be used to hide your pooch’s pills. Nevertheless, it’s a tasty, nutritious, and low-calorie treat for your dog to enjoy. One of the human foods that you really shouldn’t give to your pooch is ice cream because it can lead to upset stomach. However, if you take Puppy Cake’s Puppy Scoops Ice Cream Mix for Dogs in yummy peanut butter flavor, you know that you’re not only treating your pet to a wonderful desert, you’re giving it plenty of health benefits, too. 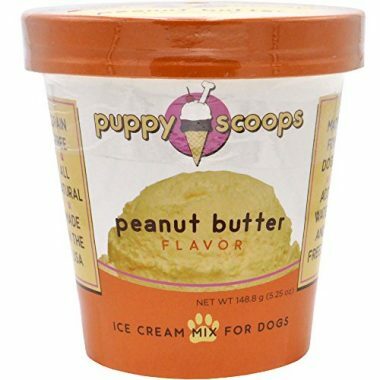 The Puppy Scoops is guaranteed to be free from lactose and grains and only contains all-natural ingredients with all their health-giving benefits locked-in in every scoop of the Puppy Scoops. Making an ice cream for your pooch is also exceptionally easy. Puppy Cake formulated its Puppy Scoops to be turned into ice cream with the simple addition of water and letting it firm up in your freezer. Once it’s done your canine friend now has its very own peanut butter ice cream. 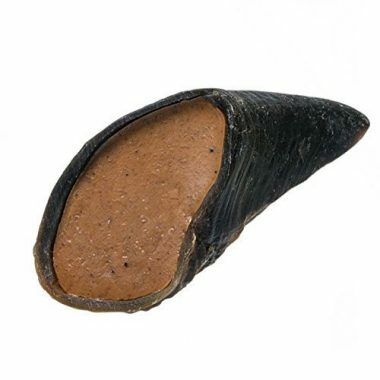 If you’re looking for a doggie treat that doubles as a nearly indestructible dog chew and dental treat, then the Pawstruck Natural Cow Hooves for Dogs should be a great choice. The Pawstruck Cow Hooves are sourced from the Midwest’s famed cattle farms that grow grass-fed and free-ranged cattle. Each of the processing facilities are carefully inspected, audited, and certified by the USDA, FDA, and other accrediting organizations to make sure you only get the best and safest cow hooves for your pooch. Each of these cow hooves are filled with all-natural peanut butter. The good thing with this is that, since the cow hooves will take a very long time to consume, you can easily fill it up with dog-recipe peanut butter such as the KONG Easy Treat or even the KONG Stuff’n, although you will need an awful lot of tubes to fill the Pawstruck if you choose the latter. Overall, it’s the combination of a longer-lasting dental chew and the refillability of the Pawstruck Cow Hooves that make it a great doggie peanut butter treat. 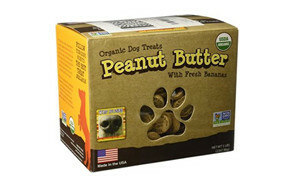 These peanut butter treats are not only safe for your pooch. They are also especially formulated for your furry pal and are not necessarily the peanut butter that you and your family consume. This makes them safer and more attuned to the nutrient needs of your pooch.